QVC was founded on June 13, 1986 by Joseph Segel and are amongst the first few companies to specialize in televised home shopping; HSN was actually the first. Of course this didn't stop QVC from reaching 7.6 million homes during their first live televised broadcast which took place on November 24 1986. For years QVC has managed to offer their members the convenience of home shopping, and in 1996 made it made the process even more convenient with the launch of their website QVC.com. Note that HSN didn't launch their website until 1999. In addition to this, QVC is also amongst the first to offer one deal a day specials. Sure Woot made the business model popular online, but QVC introduced the concept way back in 1987. Here is a quote from the QVC special value page: "Every day since 1987, we've offered one item at an exceptionally low price good for that day until 11:59 p.m. ET. That's Today's Special Value®.". 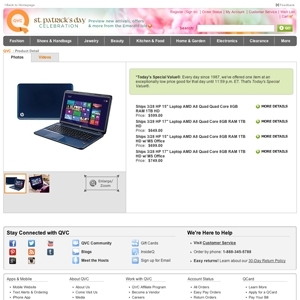 Qvc.com currently ranks #14 amongst sites offering online deals -- TigerDirect ranks #13. In the General Merchandise category, QVC ranks at #10 -- Sellout.Woot ranks #9.